Once the glue for the flat braces had cured I broke the soundboard out of the go bar deck and planed the flat braces to their nominal height. The finger braces and soundhole support braces are 8mm high each, while the tone bar has a nominal height of 13mm. 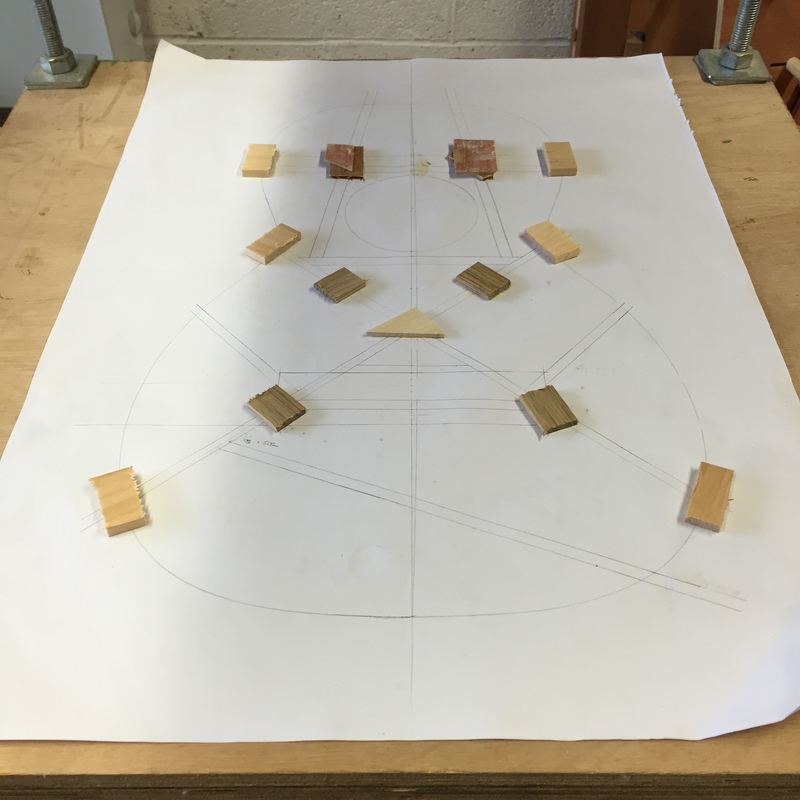 Each of the nominal heights may change a little when I carve and shape the braces to achieve the desired sound, but at this stage reducing them to a nominal height is sufficient, and also easier to do before the curved braces are fitted. To protect the surface of the soundboard when carving and planing the braces I use a thick removal blanket on top of the workbench. The tone bar (in the foreground) and finger brace (in the background), having carved the ends to fit into the X brace. The tone bar and finger braces fit into slots on the X braces, and two of the soundhole supports similarly fit into slots on the lower transverse brace. So the next task was to taper the ends of the tone, finger, and soundhole braces to a height of 1.5mm, ready to fit into the curved braces. Much of the waste was removed using a 1/2″ chisel with the bevel down, and then the final curve faired up using a curved chisel. Many builders curve their braces by sanding them on a radius dish, which then doubles as a clamping caul in the go bar deck. However I still use the method taught at Totnes, and shoot the curvature for the X braces and transverse braces on a shooting board using a jack plane. For this guitar I am using a 3.5mm curve for the soundboard (which equates to a 23′ radius, if my admittedly shaky maths is to be believed). The X braces have the full extent of the curve planed into them, while the curvature for the transverse braces is calculated from the bracing plan I previously drew. 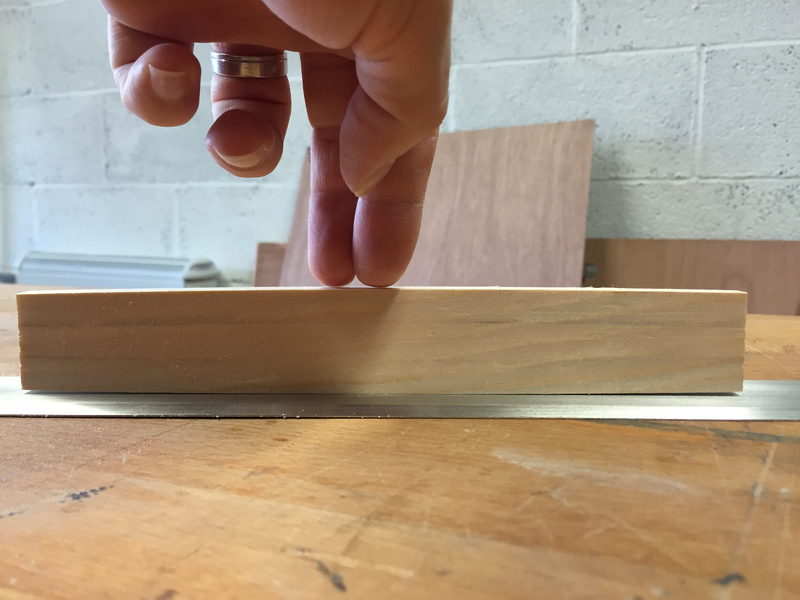 The finger and tone braces (which are at this stage already fixed to the soundboard) all have a curve under 1mm – the finger braces have a curve of around 0.25mm. Because these braces are quite thin (6mm wide each) I can get away with planing them flat as the tension of the X braces will then bend them into position. A demonstration piece in scrap southern yellow pine. YOu can see the magic point marked between the 1/4 and 1/3 points, and at the end the 3.5mm curve point. 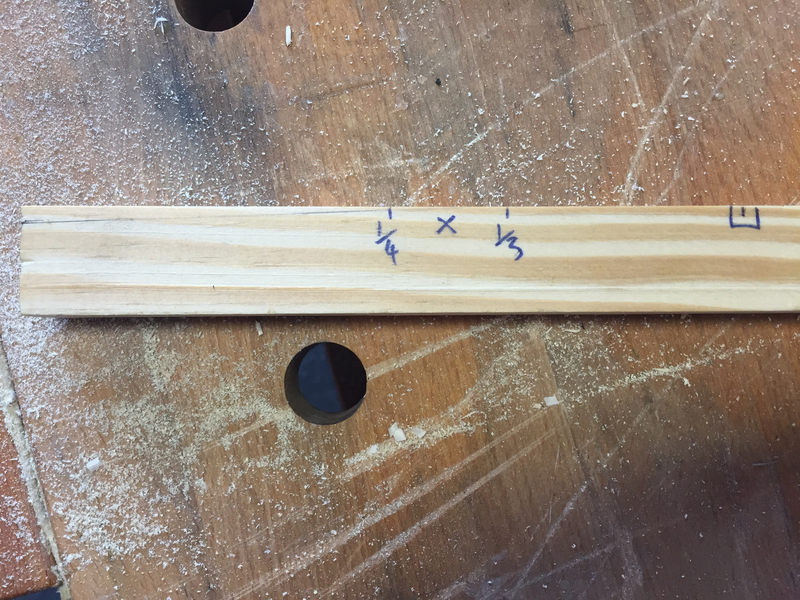 To shoot the curvature for the X and transverse braces I first mark on the length of the brace the quarter, third, half, two thirds and three-quarters points. At each end of the brace I then mark the amount of curve desired (so the full 3.5mm on the X braces). Half way between the 1/4 and 1/3 points, and the 2/3 and 3/4 points, lies the magic point, which is also marked on. I plane a straight line from each end of the brace to the respective magic point, so that the curve mark is connected to the magic point. It is then a matter of taking very fine cuts with the plane around the magic point so that the corner at that point becomes a smooth curve. This is then faired out across the full length of the brace with a single pass or two. At all times I ensure that no material is removed from the centre point of the brace – the mid point is sacrosanct when curving the braces! 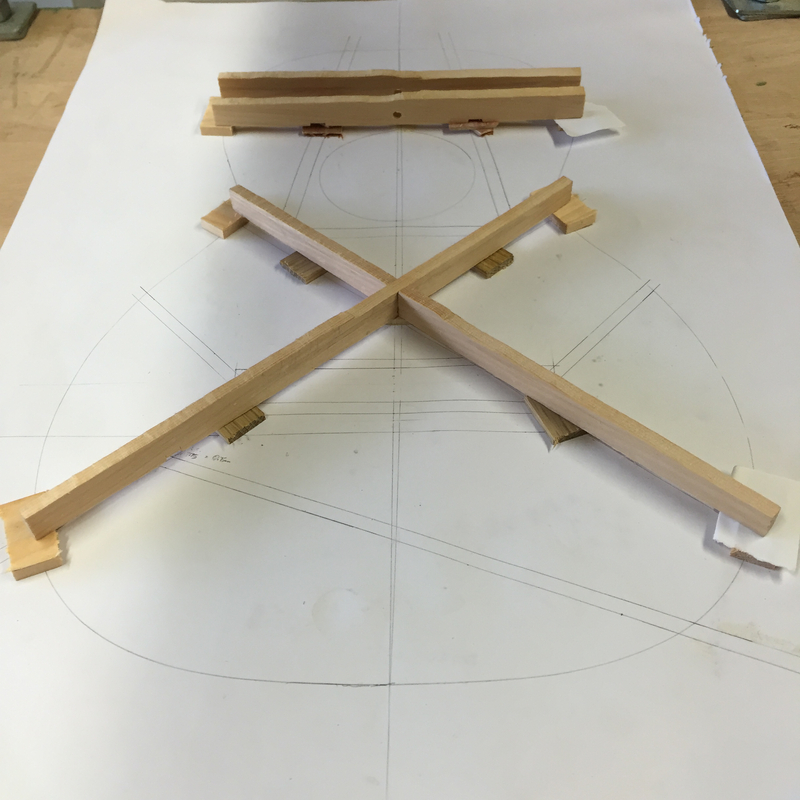 The progress is measured by rocking the brace along a straight edge, feeling for any bumps (caused by corners) or positions where the brace seats firmly on the straight edge (which would indicate a flat). The brace is done when it smoothly rocks from end to end along the surface of the straight edge. Admittedly this method is slower than using a radius dish, but means that I am fully in control of the curve of each brace and means that I can use any radius I wish without needing to build a new radius dish each time. It also ensures that the gluing surface of the curved surface of the brace is flat for a good bond, rather than slightly domed as would be the case when using a radius dish. Having curved the X and transverse braces I then cut the slots to receive the ends of the finger, tone and soundhole braces. 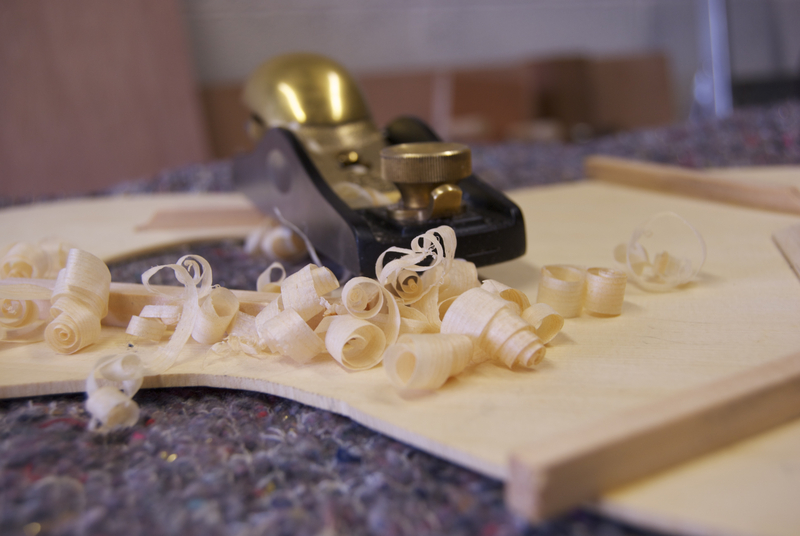 This was a case of placing the curved braces on the soundboard, and marking the position of the brace ends with a fine marking knife. The waste was then removed with a fine chisel until the flat brace end fittied tightly into the slot. The half-lap joint for the X braces was marked in a similar way, and the bulk of the waste removed with a No.2 blade in a piercing saw, and pared to a good fit with a sharp chisel. Because I don’t use a radius dish I have to find alternative solutions to support the soundboard while it is in the go-bar deck. 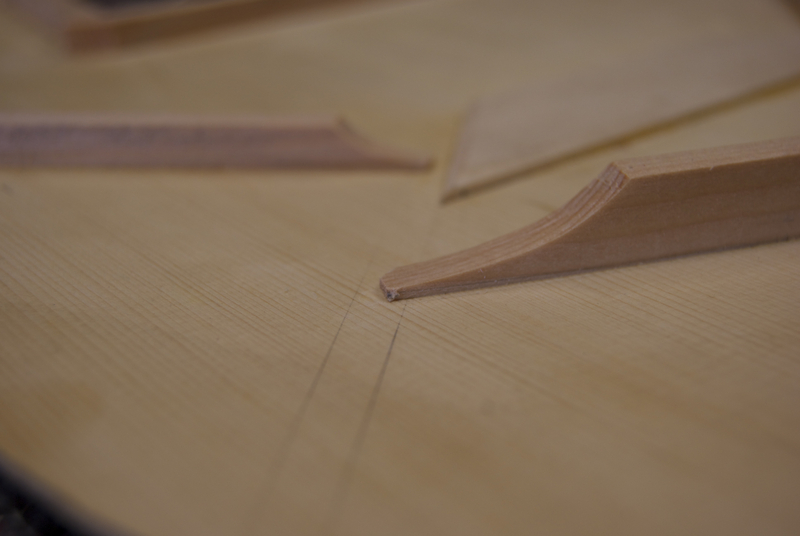 A bracing cradle that fits the curvature of the braces is easily made out of scrap, and I always start with small squares of material of a consistent thickness which support the ends of the braces at the perimeter of the soundboard. These establish a consistent body datum, and I glue them directly to a copy of the bracing plan. Further small squares of scrap are then selected so that they support the braces, and do not either leave a gap or force the brace to sit higher than the datum established by the perimeter pieces. For the transverse and X braces I normally use 4 packing pieces per brace, and glue these all to the bracing plan copy. 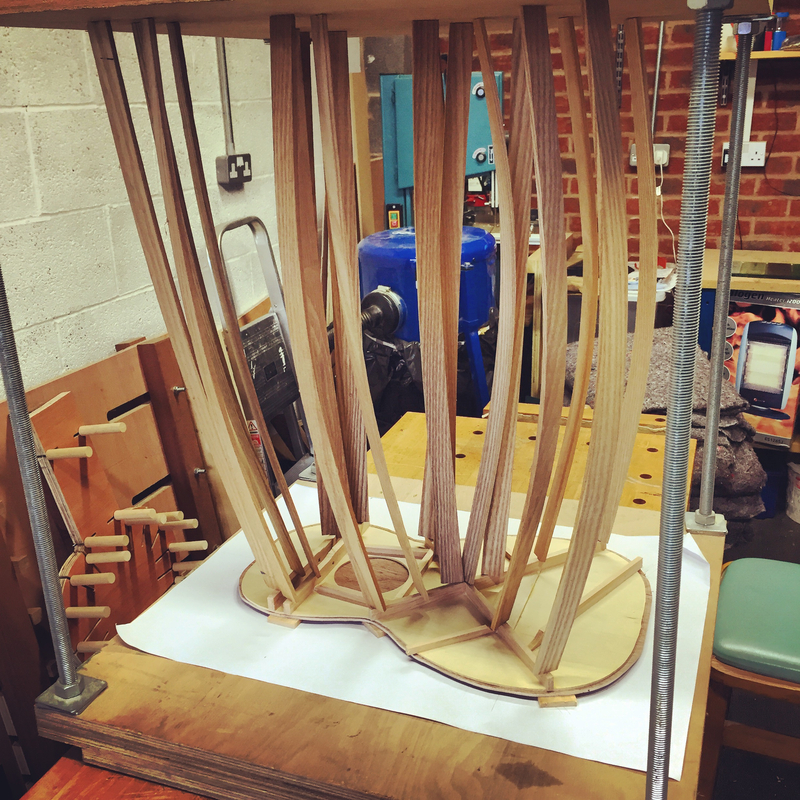 Plywood is useful for building the bracing cradle, as layers can be split off or pared away with a chisel to provide packing pieces of precisely the correct thickness. The height of packing pieces can be further built up with folds of paper, or thin stock as necessary. To prevent the bracing cradle from denting the soundboard, I cut a slightly oversized soundboard caul out of 3mm thick plywood. This lies between the bracing cradle and the soundoard, and is thin enough to bend under the pressure of the go bars. Once the glue on the bracing cradle had dried I placed the cradle, plywood caul, and soundboard all back on the go bar deck. The X braces were glued in first, followed by the two transverse braces. On a glue up involving a large number of go bars I find it best to work at one end of each brace, and work down the length towards the outer edge of the guitar. This avoids the awkward situation of frantically trying to reach into the middle of a cats cradle of go bars while the glue sets. As with the first glue-up session, I left the braces oversized so that I could later plane out any dents left from the go-bars. This is a fantastic post. I freely admit that I went with a radius dish the first time because I could understand how it worked and was convinced fixing everything to the same radius would be a benefit. There is some truth to that, but there’s a great deal of information in what you just wrote that may have lead me to take this path if I could have found it written anywhere else in such a clear manner. I like the freedom and flexibility this method gives you. Thanks James! Sorry for the slow reply, it’s been an especially manic week. Freeing yourself from the tyranny of radius dishes definitely has benefits. The quid pro quo is needing a modicum of geometry to calculate the varying degrees of curvature the braces require. But to my mind it is a worthwhile trade-off (no more routing dishes out of MDF! ).